A charism is another word for a gift or a strength. The four Dominican charisms at Aquinas College are community, service, study and prayer. Three years ago, the TRiO team decided to pull together a collection of student narratives based each year on a central theme. In the past two years, the TRiO program has produced one book around community and another around service. This year the theme is study. Why does studying mean more than opening a book? How has your definition of studying changed since coming to college? Who has helped you define what it means to study? These are a few of the questions we asked Aquinas College TRiO students when we started on our third edition of Our Voices. Their answers to these questions and many more around the theme of study are shared in this collection of narratives. Their responses are both honest and heartwarming. Our hope is that these narratives will allow all students to understand that they do not walk this academic journey alone. Many students when they enter college feel overwhelmed and uncertain. 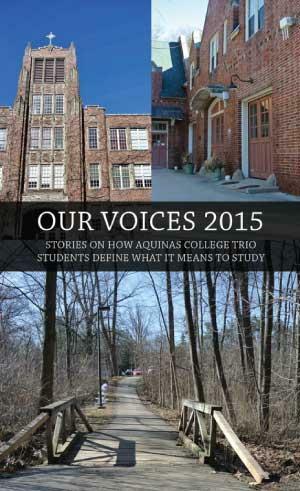 For those moments of uncertainty, the Aquinas College TRiO community is privileged to be there.